This weekend, there are two gear swaps in the area. First, October 19-21, is the OVST Ski Swap at Legacy Event Center in Farmington, UT, and then a smaller Gear Swap at 2nd Tracks in Ogden on October 22. These are an excellent way to gear up your growing kids for the up and coming season! This sounds basic, but I have shown up at a ski swap just looking for skis, only to get home and realize my youngest needed new boots as well! 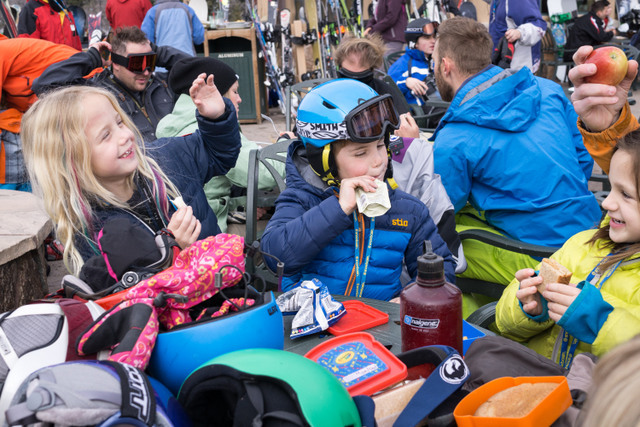 Have your kids try on their old boots, check their ski length, put on helmets and any clothing from past seasons before you head to the swap! Then make a list of what you need. Also, write down the past season’s size and/or length so that you have information to work with when you are digging through piles of gear. What length should my kid’s skis be? A quick rules of thumb is that the tips of your child’s skis should be between their chin and nose. However, really young children or beginners can have skis as short as chest height. Shorter skis will be easier to maneuver and control. While longer skis should be reserved for more aggressive skiers or people who are heavier than normal for their height. For children, I don’t worry about them being too short but don’t get them too long thinking they will last longer! Anything over their forehead could lead to a lot of frustration this winter! How do I size my kid’s boots correctly? A kid’s ski boot shouldn’t be too small, which can lead to painful, cold feet. On the other hand, boots that are too large can also limits their control of the ski. Remove the boot insert from the shell. Have the child insert their foot into the shell, move their toes towards the front of the boot so they lightly bump the front. Have them flex forward slightly as if they were skiing. There should be 5/8 – 1 inch behind the heel. Or more simply – Two fingers stacked together should fit behind the heel and shell. Change sizes accordingly until you find a match. Now put the liner back in the boot. Have the child put the boot on, buckle it, stand up and flex as though they were skiing again. Have them walk around and spend some time in the boot. How does it feel? This part is largely subjective and often times a boot will feel tight even though it is sized correctly. On the other hand, if your child has a wide foot, it really could be too tight. Boot stretching at an actual ski shop or going up a size might be advisable. 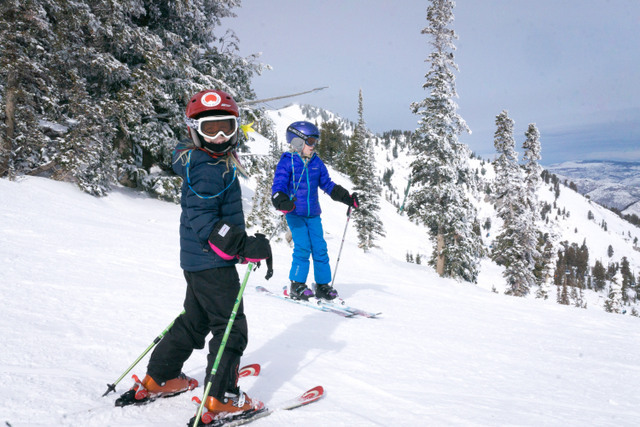 How do I know if my kid’s ski helmet fits correctly? At home, take a soft measuring tape and wrap it around your/their head about 1 inch above the eyebrows and ears. Measure in centimeters! For example, if you measure and it is 56 cm, you will likely wear a Medium (55-58cm) depending on the helmet’s size scale. When you find a helmet, try it on. It should fit snugly, without much extra room, but not so tight it is squeezing the head. Do a shake test to make sure it does not move around on the head. Wear the helmet for a little bit to make sure it remains comfortable as it will likely be worn all day while skiing.